5 things to do when you can’t poo. We’re all busy people aren’t we? Too busy to shop in person – do it online. Too busy to speak to our friends and family – Whatsapp them instead. Too busy to poo? Now we don’t often hear that from people. But life does sometimes get in the way, doesn’t it. Nevertheless, the longer we go without doing a number two, the more issues we end up with in our gut. We are all told to prioritise our health today. Extra vitamins. Time to exercise. More me-time for stress. However, do we prioritise going for a poo? Do we heck! Most people won’t even talk about it! But you know me – there’s nothing taboo about poo at Complete Health Clinic, so let’s get right to the bottom of this problem. Imagine a busy CEO of a large company. Back to back meetings all day, no time to eat let alone go for a leisurely break on the loo. Maybe he doesn’t like going in public places either – prefers the comfort of his own loo. He finishes for the day, gets on the motorway and boom! Stuck in traffic and THAT’S the moment when his body decides he needs to go. So what does he do? Well, what a lot of us have to do – hold it in and wait for the feeling to go away. Then what happens? Or how about a new mum? Just got home from the hospital and her body’s healing. However long she puts it off, at some point that poo needs to come out of her body. But because she’s uncomfortable (I don’t need to paint a picture of what has just happened in that area, do I?! ), the thought of having to go to the toilet makes her nervous. So she puts it off, ignores the feelings and certainly doesn’t encourage the inevitable. But is this causing more harm than good? We all put having a poo as bottom of our priorities. Once I actually had to run out of the back door with my knickers round my ankles because I’d left it open when Harrison was little and realised while sitting on the loo….. thank God no one saw! The one thing we should take care of is our toilet habits. If you don’t listen to your body and hold on when the signal goes for needing a poo, you can cause a whole load of issues – primarily constipation. The longer the poo is in the bowel the more dehydrated it becomes. It then becomes harder to pass when you do need to go again and can lead to a whole host of other problems. If you’re not passing stools regularly, you can then cause your system to become backed up. This causes you to lose your appetite (not enough room for food) and you suffer from pain, wind and bloating. It’s a common reason people come to me for help through colonic hydrotherapy. 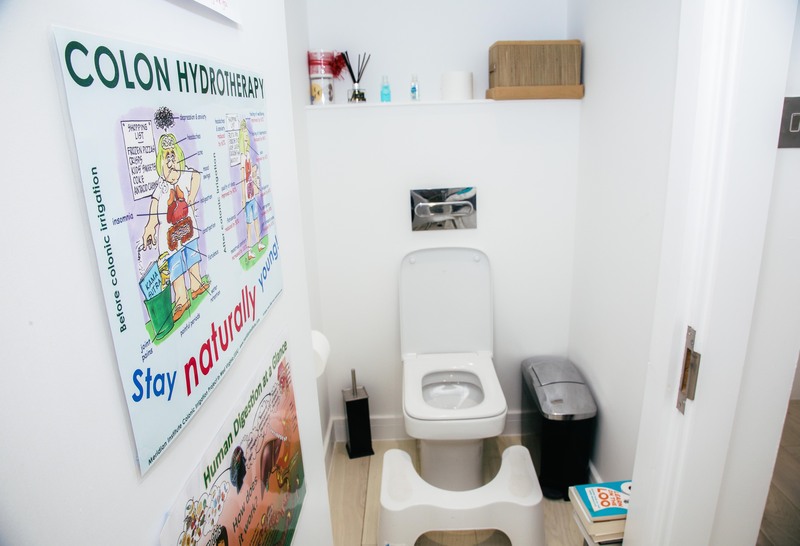 So, if you’re someone who prioritises everything over doing a number two, or you’re already suffering from constipation and need some help, here are five things to do when you can’t poo. Drink a LOT of fluids. We’re recommended to drink at least two litres of water (or other fluids) a day. Most of us rarely do. If you do up your fluids, you’ll find that your stools become easier to pass. By drinking more, you are lubricating and hydrating the stool to make it softer and more able to come out. Change your diet. Eat more fibre and less processed foods and dairy. The fibre from the fruit and vegetables helps to get things moving along the gut nicely. Other fibre-filled foods such as oats and lentils will also help soften the stool and make it easier to pass. Don’t forget adding some probiotics / prebiotics to your diet too to aid the healthy bacteria in the gut. A happy gut is one that regularly poos! Move around more. Walking actively encourages bowel movements. The motion of the body massages the colon and helps to move the stools along which in turn activates the colon muscles to make you need to go for a poo. Make time for your poo. Treat it nicely. Take your time, relax and let nature take it’s course. Get into the habit of making time when it’s quiet and you can let your body relax and do it’s magic. Some people even suggest getting up a little earlier in the morning! So I hope this helps and you see that by giving yourself some poo-time you will avoid some painful problems that have to be remedied later on. Don’t ignore your body. There’s always something better to do and somewhere else we need to be, but your health should always be your top priority. And most of all, don’t make poo taboo!